I have a Straight valve, narrow deck O-540, 8.5:1 compression, that is running hot and lean. I have 2 carbs on hand, an MA4-5 (Largest Jet) and a MA-6AA, both freshly rebuilt by GMAC76. I will put my plug in for Greg now, he has provided great service finding some oddball broken parts and turning the rebuilds around! 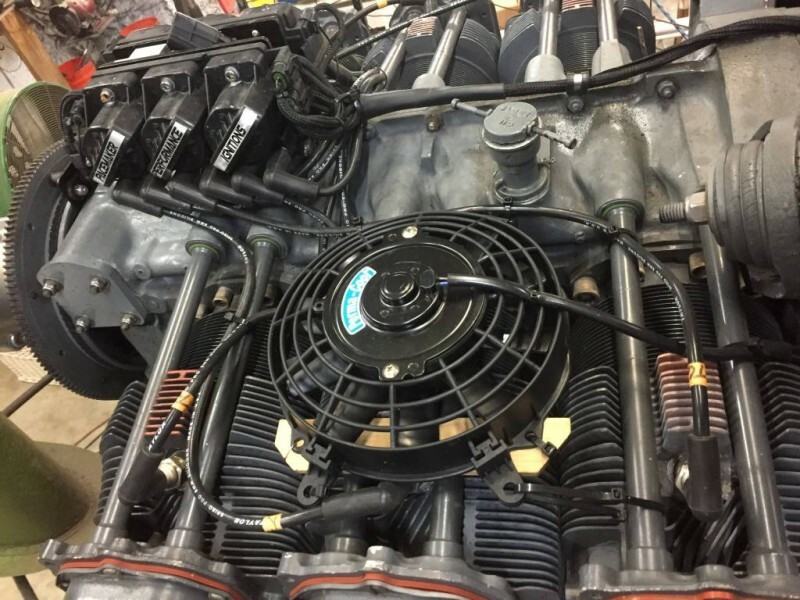 I have been running the MA4-5 for a while and the motor runs hot, 450 for 1,2 5 & 6 and 550 (or more) on #3 & 4, all measured using Cylinder Head Temp sensors. This is after tuning the economizer to full rich (full CW). I swapped to the 6AA carb and ran it last weekend without any noticeable change (economizer at full rich). Fuel pressure runs steady at 6 PSI idle, dropping to 4 PSI at WOT. I have sprayed the crud out of things with carb cleaner and starting fluid trying to find a vacuum leak with no success. I decided to quit guessing and got a wide band fuel/air sensor and mounted in a section of pipe to push into my mufflers. But I keep wondering why 2 different carbs that are made for this motor are not able to keep up? I am running a Pacemaker ignition with Autolite 386 plugs gaped to 0.025 (with copper gaskets) and timing set at 22-25 below 2,000 and 25 degrees above 2,000. The MAP is disconnected at this time (until I drill a MAP port in the carb). Turning timing down to 22 dropped cylinder temps by 50 degrees and knocked 200 RPM's off the top end. As a side note I am wiring in an additional switch to utilize the Pacemaker "Nitrous" mode. The ignition can be set up with 2 timing curves, the "Nitrous" mode decreases (adjustable) timing advance. My thinking there is to run ground with timing retarded to keep the motor cooler, but switch to full timing for max power if needed. I figure a shroud is also going to be required, but first I gotta get the fuel set right. have you done a recent leak down check? could you be sucking air through the valves or intake somewhere? I am measuring fuel pressure at the inlet to the carb, so if there was a volume issue the pressure would drop too low. I have about 35 hours on the cylinders, 2 or reman new chrome from Jurnigan and 4 are aviation yellow tag, refurbished run chrome. I have one cylinder on the STBD bank that has a sticky exhaust valve at start up. It seems to clean up when warm, but it is getting worse. I have been attributing the difference in the fuel ratio readings (Port to Stbd Bank) to that. It is on my list to rectify and I have some new headers to fit so now is a good time to replace that cylinder and lifters and see what that changes. I have sprayed all the intake tubes and couplings with (lots of) carb cleaner and found no leaks. I have scratched my head wondering if there could be an intake leak in the manifold in the sump, but then I would think she would be gagging on oil. If you are running avgas 100ll running 25° is fine with 8.5:1 CR, I would hook map sensor up to a primer port and let it do its thing, my thinking is the timing being low it will not get all of the energy from the fuel and create a lean/hotter running engine. Those plugs look great compared to mine! You can go snow blind looking at my plugs. 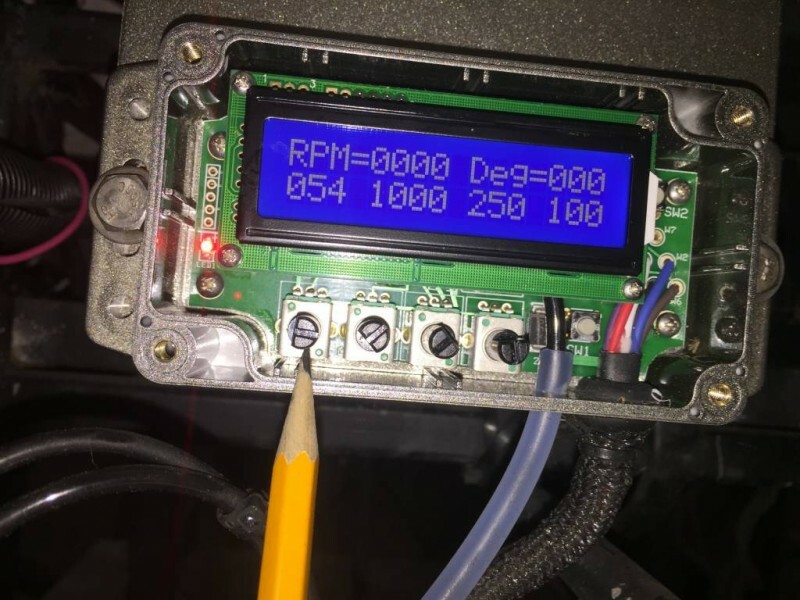 John Fenner wrote: If you are running avgas 100ll running 25° is fine with 8.5:1 CR, I would hook map sensor up to a primer port and let it do its thing, my thinking is the timing being low it will not get all of the energy from the fuel and create a lean/hotter running engine. I always run 100LL. Just to be clear, timing is 22 to 25 from idle to 2000, it’s just ramped vs. speed, just like mechanical advance on HEI. Timing is fixed at 25 above 2000. I am experimenting with reduced timing to keep the motor cooler, but need to resolve the fuel first. The MAP is not yet connected simply because I have not drilled the map port into the 6AA carb. I did have MAP connected with the MA4-5 carb. I run a lot of dry and motor is usually running above 2,000. The MAP is normally off line above 2,000 regardless, timing is just fixed at 25. The MAP just improves the idle, improves fuel consumption running skinny and improves throttle response off idle. rowdy1 wrote: Those plugs look great compared to mine! You can go snow blind looking at my plugs. That is really the question I am trying to answer, am I rich enough now or does she need a bit more fuel. Since all my readings are just to the rich side of ideal 14.7, I am trying to decide if I need more fuel, or if I need to address the cooling through other means? I do see a 50 degree drop in cylinder temp when switching timing to 22 vs. 25, which is the reason for the plan to wire in the "Nitrous" mode, but without Nitrous. Jumping into the way back machine, I first had an issue in October on my 2nd trip out with the new ignition when the motor started detonating while running very hard on dry. I got my MA4-5 carb rebuilt by GMAC76, changed the plug gap from 0.040 to 0.025 and swapped the metal gaskets on the plugs to copper. I also added the CHT's at this time. The next time out the detonation was gone, but I found the cylinder temp readings were high (pushing to 600 on #3 & 4 if I let it). I can only assume they were off the chart before adding the CHT's. I am also pretty sure that the motor temps were high on mags prior to that since the carb was way off originally, I just did not hit the full blow detonation condition. I can't directly compare temps on mags since the CHT's were not installed previously. Also, I can't go back to mags right now since the studs are frozen up and I broke one off originally and welded a stud back on to fit the mag blank off cover plates. I don't trust that stud to run mags and will have to pull the accessory housing and break out the rose bud to fix that issue. That's the rabbit hole I am at the bottom of now! Tell me about the "copper gasket" thing. What is that supposed to do? BTW, after looking at your O2 sensor pics, I am not sure if your readings are accurate. My research said the sensor needs to be 18 -24 inches from the cylinders. That information was not for an aircraft engine, but for the system in general. I have a bung welded into the collector on my left header. (15" from the cylinder"). I think you could be getting a false reading because of how close you are to open air. (very minimum back pressure). Having said all that, I think your plug color looks good. Agree on plug color as well. rowdy1 wrote: Tell me about the "copper gasket" thing. What is that supposed to do? BTW, after looking at your O2 sensor pics, I am not sure if your readings are accurate. My research said the sensor needs to be 18 -24 inches from the cylinders. That information was not for an aircraft engine, but for the system in general. I have a bung welded into the collector on my left header. (15" from the cylinder"). I think you could be getting a false reading because of how close you are to open air. (very minimum back pressure). Having said all that, I think your plug color looks good. John Fenner wrote: Agree on plug color as well. I'm starting to suspect something valve wise or cam timing, reversion into intake system, acting like an EGR valve causing lean condition. Recent leakdown test at all? Some guys I have talked to say they know people that added CHT's and then they kept stopping to cool down, just like I have been doing. They tell me to get rid of them! Other folks with injected motors and CHT 's tell me their motors stay cool, no issue. My goal is to get is as cool as I can. After taking a lot of temperature readings, I have pretty much found that I consistently read 100 degrees less using my IR gun vs. the CHT readings. The most accurate IR readings are on the fin just outboard of the CHT port, right under the lower spark plug, that is where I get 100 degrees less. 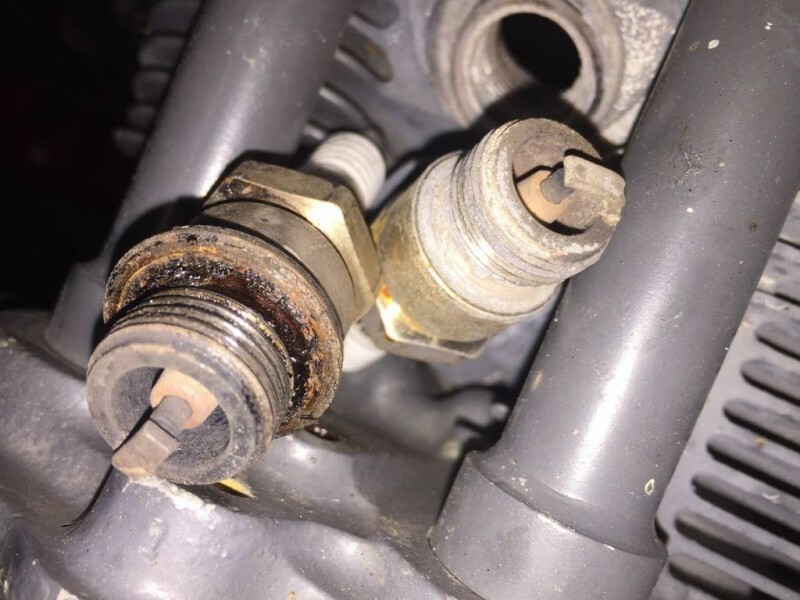 reading around the top or bottom spark plugs is hit or miss on matching up with CHT. #3 & #4 stay right around 550 when running deepwater at cruise, others at 450. Temps will run 50 degrees hotter on ground before I let it cool. Oil temp is running just fine, 180-190 with vernathan installed on the hottest days. The agreement on plug color being good tells me to let the mixture ride for now, much richer and she probably starts gagging on fuel. I had hoped to find too rich and then back up a bit. I ran a leak down not too long ago and will go through it again while I solve the sticky exhaust valve. I guess I can check cam timing when I pull the accessory cover off in a few weeks, there is always the possibility that someone advanced the cam over the last 50 years! 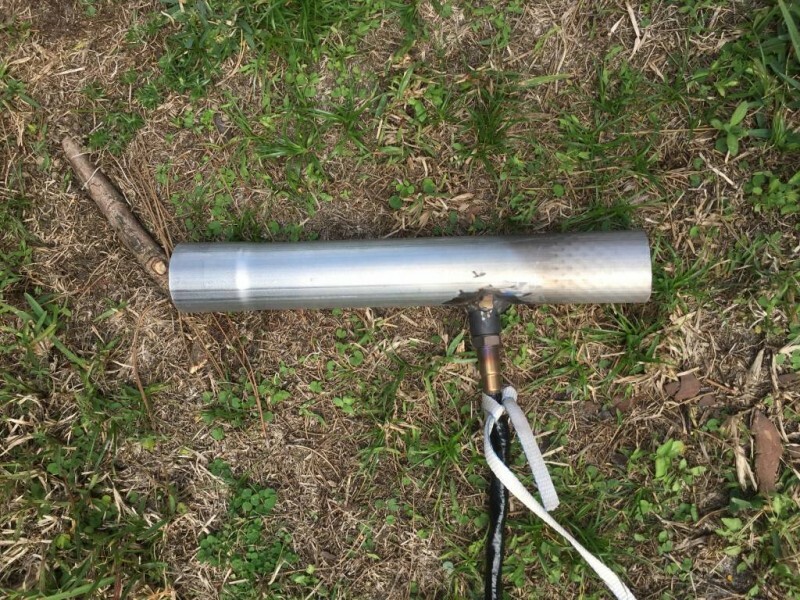 They keep the plug temperature down and helped cure the initial detonation issue. Thanks for the input on the sensor location, I guess if anything it would make it read leaner? Maybe I just send you my gauge and you can take readings using the set up I have and also take some from the bung on your exhaust?? I am trying to rectify (in my brain) the thoughts about things that make it run lean vs. the sensor readings showing slightly rich and agreement on the plug color. How could I have a lean issue if the thing is not lean? 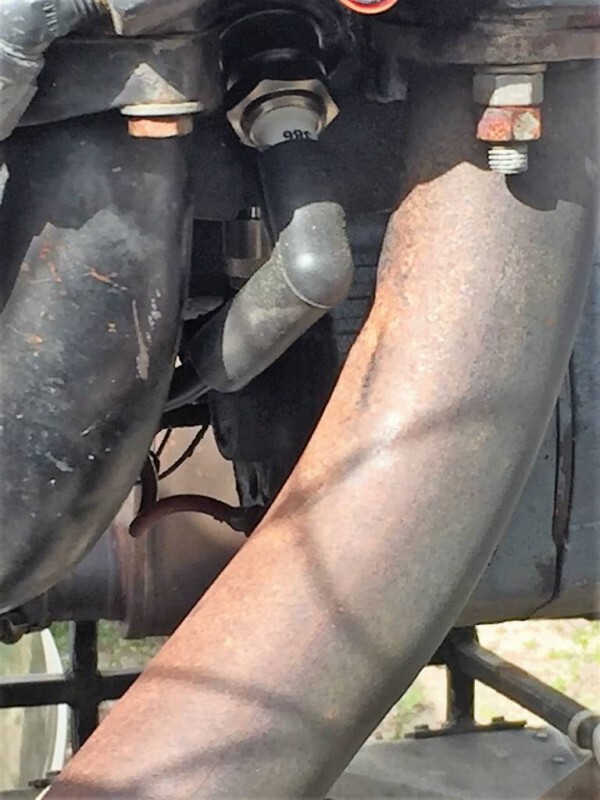 If it runs good and strong, plug color is ideal, it isn't breaking up when under a load, let it eat, have you tried the sensors on bottom plugs at all? You can send me your O2 set up, but I know mine is running lean! I have zero color on any of my plugs, and wont run it again until I have made drastic changes of some kind. John Fenner wrote: If it runs good and strong, plug color is ideal, it isn't breaking up when under a load, let it eat, have you tried the sensors on bottom plugs at all? I am using Bayonet style sensors that screw into ports on the heads, this is a feature on most Lycomings and is the preferred recommendation by Lycoming. 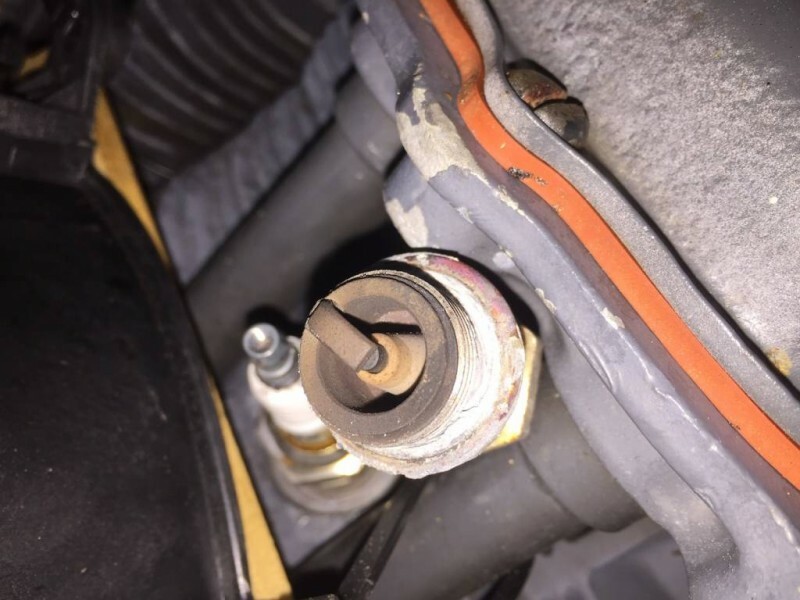 You can see it behind the lower spark plug. No, motor is not breaking up, it is making good power. I lost about 65 RPM swapping from the MA4-5 to the 6AA, but otherwise no difference noted. I have even added a fan on #4 to test out (note temporary rigging...). It helps some, I am thinking of building a shroud around 1 of these on each bank. Last edited by Slidin Gator on Tue Feb 12, 2019 4:11 pm, edited 1 time in total. That's some good rigging right there. You and I may be related! rowdy1 wrote: That's some good rigging right there. You and I may be related! Here is what the timing curves look like on my present settings. The area between the red and orange curve is where the MAP plays, the higher the vacuum the higher the timing advance. The red line is the WOT curve. I have -3 degrees of advance dialed into the Nitrous mode (and No bottle, just sayin). When selected, Nitrous mode ignores the MAP and just follows the blue RPM curve (if you are on nitrous you are WOT anyway...). The primary reason I switched to this ignition is to eliminate interference with dog tracking equipment, that issue is solved. The ignition is water proof, a key advantage for sure, I'm not covering up in a rain storm. Finally, it is a joy to adjust timing vs. tuning dual mags for sure, just a screwdriver! Adding the Nitrous mode to drop timing and help with motor temp is another bonus. I too have Pacemaker ignition, where did you get this chart? That 35 deg @ 2000 rpm seems like way to much. Maybe that's at max vacuum. rowdy1 wrote: I too have Pacemaker ignition, where did you get this chart? That 35 deg @ 2000 rpm seems like way to much. Maybe that's at max vacuum. I made the chart myself and you are correct that 35 deg. at 2,000 RPM would only occur at throttle closed, the orange line is just the max timing limit at full vacuum, based on RPM. So If I shear my prop off there is a limit to the timing. Throttle is pretty open and MAP is pretty low as RPM's approach 2,000. Beyond 2,000 the MAP is offline and timing is fixed at 25 (or 22).. 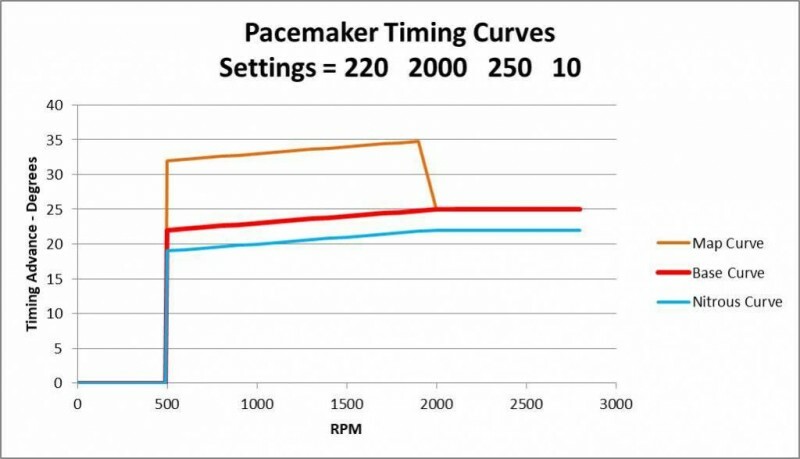 This is all adjustable and the curve shown matches the Pacemaker settings as I have them now (numbers on the chart). I have never tried to adjust mine, don't really know where to start. I was going to fix the lean condition and then get Darren to adjust it. Hurry up and fix yours then you can tell me how to fix mine! Yah, Darren has been awesome to work with and the system is really simple. That said, you gotta understand it. There are 4 pots under the cover that are used to set the timing curve. It is entirely likely that your unit is not set up and your timing is way off the chart (mine was on first contact). Turn on the ignition but don't start the boat. Take a picture of the display. The numbers I show in the title of the chart match up with my settings at present from Left to Right. Unscrew the cover off the display and you will see 4 adjustment pots and all of this will start to make sense. 10 = degrees of Map range, so at idle the timing is the 22 degrees of initial, plus 10 degrees of MAP or Vacuum advance = 32 degrees total. You very likely have way too much timing at the moment, making those plugs run snow white. There is another screen you can get to in order to set up the Nitrous Mode timing retard. Last edited by Slidin Gator on Tue Feb 12, 2019 9:53 pm, edited 1 time in total.